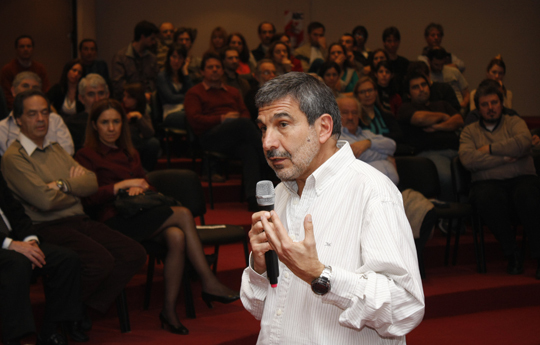 In the framework of the CNEA Seminars, which propose the participation of outstanding professionals to talk about issues of interest for the scientific community, the president of the National Scientific and Technical Research Council (CONICET) talked about “Reality and Challenges”. During his talk, Salvarezza presented the figures of the last ten years: in the year 2003 the Council had approximately 3.800 investigators, 2.350 fellows and a budget of $ 236 millions. Afterwards, he compared those numbers with the current ones: 7.550 investigators, 9.100 fellowships together with professionals, support technicians and administrative assistants. “In this decade CONICET’S budget rose 12 times, reaching $2.889 millions”, said Salvarezza, and showed statistics, projects and shared the evolution and growth of the Council. As regards the training for qualified human resources, he highlighted the leap in the number of trained doctors/PhDs and noted that “thanks to the change of admission policies in 2003, CONICET grew and trained doctors’ number/ PhDs’ increased from 300 to 1.000”. During his speech, he indicated that 90 per cent of CONICET Implementation Units (UE) also depend on National Universities, where CONICET destined more than $2.100 millions of its budget in 2012. According to statistics from the Scientific American and the World Intellectual Property Organisation, Argentina holds an important position in the international scene regarding both volume and quality of scientific production and innovation. Furthermore, Salvarezza mentioned one of CONICET’s most important policies: technology transfer, carried out during these last years through agreements and services. In the case of High level Technical Services (STAN), generated by the Council, he explained that “During 2012 a number of 2.000 services were provided to 1.000 contractors, of which 63 per cent are national small and medium sized companies”. Thus, Salvarezza highlighted the importance of transfer to achieve a social and economic impact. Finally, as regards his current role as president of CONICET, he expressed his determination to accept the challenge at once for he considered that “it was a special moment for Science and Technology in the country”. In his opinion “this is the first time this activity is valued by the National State”. To conclude he showed that CONICET has built 300.000 square meters and 120.000 square meters are being constructed at present. “Since I started working in CONICET, back in 1977, there has never been so many public works”, he stated.